Information for Cabin No. 1 is available upon request. 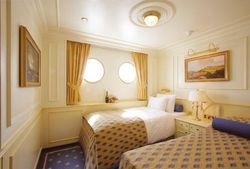 The Two Bed Cabins in Category C are located in the forward area of the Cabin Deck. Two portholes, TV with video, minibar, dressing table and stool, closet, safe. Two single beds. 22 sq. feet with shower, WC, marble sink, golden fixtures, hairdryer, outlet for razor. 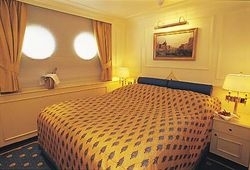 These comfortable Double Bed Cabins are located on the Cabin Deck, where you can also find the Boutique and Hair Salon. Two single beds that can be combined into one double bed. 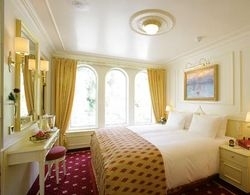 Two portholes, TV with video, minibar, dressing table and stool, closet, safe. 22 sq. feet with shower, WC, marble sink, golden fixtures, hairdryer, outlet for razor. 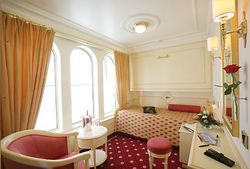 The Junior Suites are conveniently located on the Promenade Deck, where you can also find the restaurant, lounge, library and reception. Queen size bed with two separate mattresses. 25 sq. feet with shower, WC, marble sink, golden fixtures, hairdryer, 110v outlet for razor.